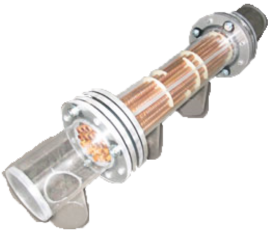 The High-K Heat Exchanger is a high-efficient, straight tube heat exchanger, capable of obtaining 5°F approach temperatures. The performance can be compared to that of a plate and frame, however, with the straight tube design, the dirty side can be inspected or cleaned while leaving the system side running. Stand-by and ease of maintenance are what High-K is all about! As a leader in manufacturing shell & tube heat exchangers, High-K has set the bar with its unwavering commitment to quality and exceptional client service. Through their extensive inventory of diverse and customizable heat exchangers, their talented team goes above and beyond to make sure your needs are not only met, but exceeded.